With its former name "wine road" referenced this road on the great winepress, formerly at the corner of foliage space was located (see FIG. Well Plate 31). Due to the incorporation into the city of Karlsruhe she had to be like others in many places, changed due to an existing already in Durlach marking "wine road". They opted for the colloquial name "In the neighborhood", which goes back to the division of the village into four quarters. In the photograph above the former side and rear view of the wine is to be seen. Behind the two adjacent gates facing the street, the covered parking spaces were for the fire (cf.. Sheet 32??). Also, the patch on the roof hose drying tower is clearly visible. After they had finally approved in 1874 the establishment of a volunteer fire corps, is should this develop in the coming years, quickly became a functioning team. Even before they arise new handmade paper (making) and new bucket, two fire engines from poplar wood and a large fire engine was purchased. For the formation of the Corps was erected at the Edelmänne on the old foal grazing a riser House for sample applications. To rescue the wounded soon the Ambulance Corps could already be used with a mobile stretcher. 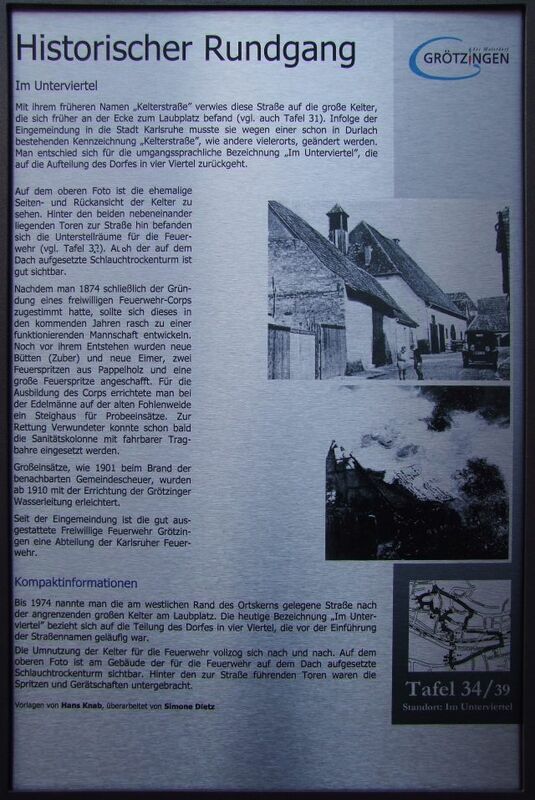 Large-scale operations, such as in 1901 a fire in the neighboring municipality Scheuer, were relieved after 1910 with the establishment of the Grötzinger water line. Since the merging of the well-equipped volunteer fire department Grötzingen is a division of Karlsruhe firefighters.